Last night's results in the two Manitoba by-elections in the ridings of Morris and Arthur-Virden showed that Greg Selinger's NDP government has indeed taken a big hit from the increase in the PST that started their poll numbers spiraling downwards in 2013. Though the winners were never in doubt - both ridings are solidly Tory - the NDP dropped more than half of its vote share from the 2011 provincial election and, overall, finished third on the night. We'll start in Arthur-Virden, where the results were particularly bad for the New Democrats. PC candidate Doyle Piwniuk won handily with 68.2% of the vote, improving upon Larry Maguire's performance in 2011 and putting up the best numbers for the Tories since at least 1990. Liberal candidate Floyd Buhler finished second, surging from 3.8% in 2011 to 16% last night, the best performance for the Liberals in Arthur-Virden since 1995. He was the only candidate last night (excluding the Greens and the independent Ray Shaw, who did not run in 2011) to get more raw votes despite the steep slide in turnout. Buhler received 738 votes, compared to 288 for the Liberal candidate in 2011. The New Democrats' Bob Senff fell most sharply, to just 10.4% after the NDP took 30.2% in this riding in 2011. That was a drop of almost 20 points, and the NDP took just 21% of the vote haul they did in 2011. It was their worst performance since before 1990. The Greens' Kate Storey captured 5.3% of the vote. 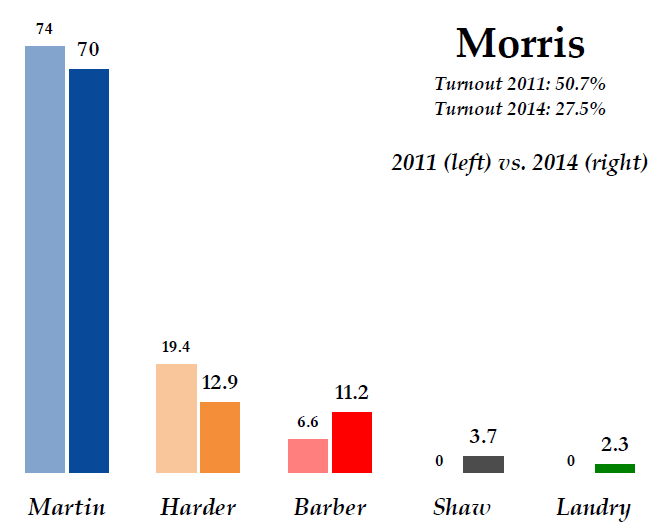 There was less movement in Morris, but again the NDP lost support to the Liberals and the Greens. PC candidate Shannon Martin's vote share was slightly lower than Mavis Taillieu's, at 70% to 74%, but that is a minor quibble when you take more than two-thirds of the vote. The NDP's Dean Harder narrowly placed second, with 12.9%. That was a drop of 6.5 points and the party's worst showing since 1995. The Liberals' Jeremy Barber took 11.2%, up from 6.6% in 2011, and their best performance since 2003. Shaw took 3.7% of the vote while Alain Landry of the Greens captured 2.3%. Overall, it was a rough night for the New Democrats. In these two ridings in 2011, they had captured just under 25% of votes cast. That fell to less than 12% last night. The Liberals increased their share from 5% to 14%, while the Tories held firm. Average vote share across the two ridings (eliminating the difference of turnout between the two) was 69.1% for the Progressive Conservatives, 13.6% for the Liberals, 11.7% for the New Democrats, and 3.8% for the Greens. In 2011, the average vote share in Morris and Arthur-Virden was 70% for the PCs, 24.8% for the NDP, and just 5.2% for the Liberals. That means the Liberals picked up 8.4 points last night, primarily from the NDP. They dropped 13.1 points, with the remainder going to the Greens and Shaw. The PCs dropped by just 0.9 points. If we apply those proportional changes to the province-wide results in 2011, we get the Tories at 43%, the NDP at 22%, and the Liberals at 20%. That is remarkably close to the last Probe Research survey, that put the Tories ahead with 48% to 26% for the NDP and 20% for the Liberals. These ridings did just about as expected in that respect, and the results go a long way to confirming the NDP's slide. It also suggests that the Liberal support recorded in the polls can actually manifest itself at the ballot box - at least in a low-stakes by-election. But what about a general election? But since they are solid Tory ridings why would anybody expect change ?? You know I'm seriously beginning to wonder if we aren't seeing a Tory leadership race underway ?? Sure nothing is declared but polls all over the place are showing prospects doing their thing? These Manitoba results are par for the course. Numbers like these in religious rural Manitoba have been consistent since the 1960s. A slight liberal uptick is the only news of interest here. The Arthur/Virden riding reinforces the strong Conservative vote there, as it was these rural voters that propelled to Conservative candidate to a slim 350 vote victory over Rolf Dinsdale in the recent federal by-election of Brandon/Souris (he won every poll in the city of Brandon, except the three seniors homes). No real news with these results. Call me when there's an election in Winnipeg. THAT's where the Manitoba is won or lost. Par for the course for the PCs is enough to win a majority though. That's one of the strange features of our electoral system - the PCs in Manitoba could lose votes compared to the previous election yet win quite a few more seats. There was a new poll out in Ontario in last week by Forum. Any chance you will be to give us some information on what it means? Also are there any polls from the two ridings that are having by-elections? Yes, check out the By-Election Barometer on this site to see the results of the two by-election polls. Smells like 1988 Manitoba election repeat may be on the way. Strong left-of-centre dissatisfaction with an NDP government has nowhere to go but to a moribund Liberal Party. Yah, I think that's a fair analogy too. Though I think the PCs are stronger now than they were in 1988. Certainly possible we could see a similar situation to 1988 but, the Liberal party is still significantly below its 1988 totals. For example, in the riding of Arthur in 1988 the Grits captured 30% of the vote last night in the successor riding of Arthur-Virden they garnered 16%. According to a poll on today's Globe Justin's Senate move is overwhelmingly supported !